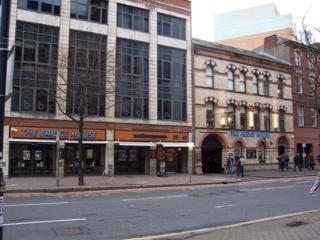 The Bridge House, previously called Wetherspoons is a Lloyds No.1 bar still owned by JD Wetherspoons. This bar has an English look and feel to it, with most space taken up with tables and chairs. At night the music volume gradually creeps up and combined with the plasma TV's showing mad graphics, it's anything but relaxed. The family section is available upstairs to suit those who wish to have a "quieter" night. There is also a value-for-money food menu which serves some decent food - good for during the day. The benefits of this bar include its cheap drink and ample gambling facilities. Have you got Google Earth on your computer? If so, then download the Google Earth view of The Bridge House. Is this the wrong position for The Bridge House? If you think so, then modify its position. Click / Tap the button above to get directions from where you are to The Bridge House. I would have used the Bridge House quite regularly,but last Thursday night this changed; I came in with my wife and went up to the quite empty bar to order a drink, made eye contact with the barman and waited (twenty pound note visible in hand) for him to finish serving the one other customer at this part of the bar. Whilst doing so I casually looked round me as you do, and noticed two girls coming down the stairs in the distance and then approaching the bar; the barman had just finished serving the previous customer and seamlessly asked the girls who had just approached the bar "what's yours?" Cue for me to tell him what I thought of his customer service skills and leave the bar with my wife for a nearby establishment where we were served with courtesy. To say that I am disgusted by the friendliness, service and quality of the food served by this establishment is an understatement. I will NEVER return to this restaurant; it is beyond a joke. I organised a christmas dinner for a smallish group of 13 people for the bridge house; wednesday, 8pm, pre-booked, gave deposits and menu orders for the 13 people. When we arrived we were seated 30 minutes late , told that 3/13 of the starter orders couldn't be served as they had run out. All 13 people had to reorder their starters (and this was true for all 3 courses) even though the staff had been informed at least 2 weeks in advance of everyone's preferences. After the starter, the waitress took an hour to clean the dirty plates and another hour (2 in total) to deliver the main courses, which also had to be ordered again. I was utterly disappointed with my main, as the roast turkey and ham order had approximately 30g of meat on the plate. After another hour of waiting we had to approach the staff, after the lights came on, and last order had occurred, to request our desserts, which again, had to be individually ordered for everyone. After the abysmal desserts were done, there was no sign of the tea/coffee and mince pies offered on the menu. This was four an a half hours after our dinner booking. After dinner, the terribly rude, hostile staff offered a 20% discount on our orders but argued with us when trying to settle the bill; demanding more cash. After stating we were not giving a tip, the waitress moodily told us that was the amount to be paid and we could sort out further discrepancies ourselves. This ruined a wonderful night out and disappointed everyone involved. The sad part is the restaurant wasn't even busy. The staff would have been given sympathy if it had been remotely busy, or the orders had been complex. However this was not the case, and the blame for a terrible evening lies solely on the employees of the bridge house, weatherspoons. just one of a very small handful of pubs in belfast that go out of their way to sell a number of locallymade ales and beers, and for that alone i salute them. Nice to see someone being able to stand up to a certain monopoly beer/stout producer in Northern Ireland. This is the first time I have been visited a pub in North Ireland. I have tried the ale called Hilden which is a local beer. It was nice, but strange because in my country we drink all the time Pils beer. The bargirl/server was very pretty but not friendly. I had some food and it was good, it was not expensive. Next week I go to Derry there is another Watherspoon pub there. I like Belfast, there is nice shops. Nice bar, went there in afternoon. Good range of ales. Staff are friendly. There is one called ***** (her name came up on the till) who is very pretty but scowls at the customers. Decor OK. Comfortable, like a London pub in winter. Had no time to try food. I called in a few days ago on a visit to Belfast. It has a good range of cask beers, and serves wine by the bottle. Their food is basic but good-basic. The staff are friendly except for one barmaid who is really pretty but you couldn't be nice to her. She has a hairdo like a Russian princess, and make-up a bit like a silent movie star. But fair enough, she's not one bit rude like a lot of barmaids I have come across over the years, and it was very busy indeed so maybe she was worked off her feet. The beer was good, it was local, I think called Hilden's. They show BBC news on screens, and they have newspapers in the toilets. So well worth a visit for a good lunch and good ale. Clientele neither here nor there. This is a good bar for ale, good hand-pumped stuff. The staff are friendly, although Janet, who is really nice looking and has a nice smile to her colleagues, doesn't seem to like the customers. Pity, but I worked in a bar and you can get a bit pissed off sometimes. I give this bar about 8/10. relaxed pub,and one that actually has funny bar staff to brightin up your day. overall cheap and cheerful. its always a pleasure entering and leaving feeling warm. It's quite OK, and redheaded Janet is definitely a plus. She never smiles at the public, which is a pity. As she has a nice smile. Near to rail station, and a good range of ales. Very good range of draught ales. Service is generally good, even redhaeaded Janet occasionally smiles. Cosy decor. And not far from railway station so handy for quick ale on way home. I visit Belfast regularly from Merseyside and often attend the Bridge House. Always found the staff and customers friendly, although the vibe does change later in the evening. Like anywhere, you sometimes get fighting when people are full of drink. Decent enough boozer !!! Average Pub, A bit smelly and various crowd. Good for a drink or two only if you can pass the doorman. Rude and use their favourite foil language if something goes wrong. They have a shoes policy that I would appreciate to know how it works. Not the best, if you want a drink, I would recommend you somewhere else where you don't have to go through this rubbish, as I am sure you don't want to spoil your night. used to go there on a tuesday nite b4 the cinema, we were able to get upstairs for a few nites then they closed upstairs (at about 6.30) the service was good for the first few weeks, then they regularly ran out of food, got orders wrong and the wait nearly made us late for the cinema several times. Used to be good, now awful Laverys is much better value for a meal before the cinema. I have never visited such a horrible and smelly pub in my life. Normally Wetherspoons pubs are of a good standard. The carpet reeked of vomit and booze and the chairs were filthy. I suppose that's the price we pay for cheap drink! I suggest a general price increase and use the extra money to hire a cleaner and carpet shampooer!. I think it's really nice pub.There are a beautiful Waitress and bar staff!I like that! Be sure you wear a crash helmet and body armour if you visit, or even walk past, this place. Dangerous spot. Beware. place 2 b every sat cheap drinks good music luving it!! not bad inside decent food at good rates too. Door staff are the worst thing about it any visitor to this country must hate door men the only words in their vocabulary is SORRY NAT T NITE LADS or REGULARS ONLY. Sad uneducated fools. Horrible and dangerous at night full of spides. Not bad food during the day, but still fights all the time. Cheap drinks. That's it. Overall the crappiest pub in Belfast. Been once. Never again. Cheap drink, thats the only reason i go! to get topped uo before i head into town!! But it takes forever to get served, espec at the weekends!Also very rough crowds at night time! havent been once and there hasnt been a fight outside and police about!